The Atlas Power ECM-20 is a 20A Power Conditioner and AC Spike Suppressor that is designed to be used as a standalone unit or in conjunction with an ECS unit up to 1000ft away. 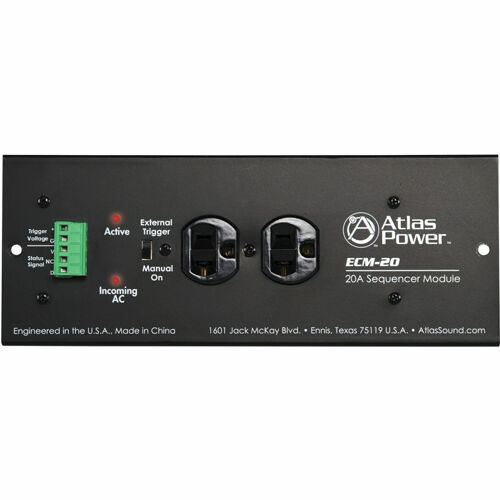 The ECM-20 features AC Spike and Surge Suppression, AC Mains Voltage monitoring, EVS circuitry, and Remote Activation. The ECM-20 is designed to be conveniently housed in the ECM-RACEWY6 for the addition of multiple outlets directly connected to the AC mains from the electrical panel.